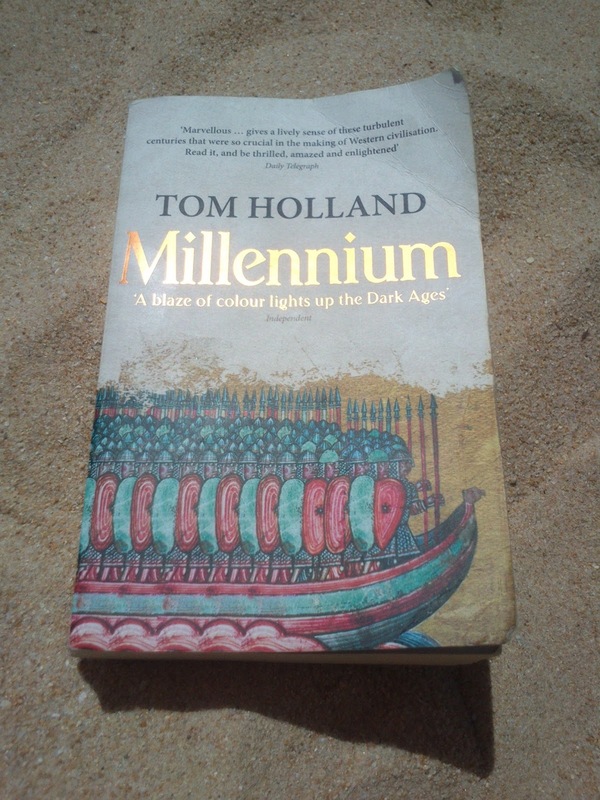 Tom Holland's Millennium was my 'big read' for the summer hols. I managed to stow the weighty tome in my EasyJet hand baggage without exceeding the airline's limits. Most of the book was read airport departure lounges or on one or another of the Algarve's wonderful beaches between dips in the sea to cool off after baking in the heat. Holland is an acknowledged master of narrative history and his skills were well deployed in telling the story of what happened in the period that spans a hundred years either side of 1000 A.D. He traces the development of Christendom from the conversion of Constantine in 312 to the capture of Jerusalem in the First Crusade in 1099. Along the way he describes the repeated attempts on the part of rulers from East and West to recreate the glories of the old Roman Empire, and the rise of the papacy as the dominant force in Christendom. Holland introduces his readers to some of the big players of the time including Charlemagne, Rollo the bloodthirsty Viking 'convert' to Christianity, Fulk Nerra, the Godfatherish Count of Anjou, an assortment of Ottos and Henrys. Then there's 1066 and all that. All the familiar elements of Medieval history are here. Want to know how knights first won their spurs? Why power hungry potentates started building castles? Maybe it's blood-spattered battle accounts that you're after? Look no further. Now, in the period leading up to the end of the first Millennium, folks in Christendom weren't looking forward to big parties and fireworks displays, all set to a Robbie Williams soundtrack to mark the advent of the year 1000. Rather, it was feared that the dawning of the 1000th anniversary of Christ's birth might mark the end of the world, or at the very least, the coming of the Antichrist. When neither happened, attention was fixed instead on 1033 A.D., the 1000th anniversary of Christ's death and resurrection. Augustine of Hippo (not to mention the Bible) warned believers of the folly of predicting when the End will come, but people will never learn. That apocalyptic visions had such a hold on the Medieval imagination is only one of the ways that makes the so-called Dark Ages seem so different from our own. However, as Holland points out in his preface, we who live at the beginning of the third Millennium are not without our secularised doom laden scenarios, such as the threatened devastation of human life by global warming. There is much that could be said in response to reading Holland's work, but what especially struck me was just how spectacularly wrong-headed the was the whole notion of 'Christendom'. It began with the conversion of Constantine, with the Roman Emperor attempting to Christianise his realm. In its origins Christendom was Erastian. Yeah, yeah, that's an anachronism. Thomas Erastus was a sixteenth century man. But it's the Swiss theologian's name that's associated with the view that the church should be a servant of the state. After Constantine successive 'Holy Roman Emperors' meddled in church affairs, appointing bishops, removing popes and so on. Figures such as Charlemagne, the Ottos and the Henrys believed that they had been specially anointed as priestly-kings to defend Christendom and rightly order the church in their domains. But over time the papacy developed big ideas of its own. Gregory VII claimed that the Bishop of Rome had absolute power not only over the church, but also the right to remove emperors'should the need arise. And when it did, Henry IV had little option but to grovel before him a Canossa. In the preface, Holland argues that Canossa was a watershed moment in history, when church and state first began to divide into distinct realms in the West. The thought is not developed later in the book and I'm not sure that it can be justified by the evidence. If anything Canossa represented at attempt by the church control the world of politics. But having the pope lord it over the emperor was as bad as the church being treated as the plaything of earthly potentates. Church and state are two distinct institutions, ordained by God for two very different ends. The two should not be confused or conglomerated. The power of the state is political and may legitimately include the use of force to uphold the law and in defence of the realm. The power of the church is solely evangelical. State power must not be used to advance the mission of the church. Her weaponry is not carnal but spiritual, a lesson that the Medieval Church tended to forget. And so to the crusades, an account of the first of which brings this book to an end. Not even the Magisterial Reformers were clear on this point, hence their title, meaning that they were willing to utilise the power of the Magistrate to further and defend the cause of Reformation. English Separatists such as John Greenwood and Henry Barrowe had a better insight into the New Testament's teaching on the relationship between church and state. Rather than waiting for the Elizabethan state to reform the church Erastian-style, they argued for Reformation Without Tarrying for Anie and paid for their principles with their lives. The church may be called upon to die for it's beliefs, but she should never be prepared to kill for them, or ask others to do so on her behalf. Christendom with its 'Holy Roman Emperors' bearing their 'sacred lances' into battle and lordly popes preaching up the crusades tragically ignored the words of the Prince of Peace before Pontius Pilate, 'My kingdom is not of this world.' (John 18:36). I'm not saying that the Church of the Middle Ages was totally devoid of gospel light, but as Holland's narrative of the period demonstrates, there was far too much of 'this world' and far too little of Christ in Christendom. To conclude, Millennium is an absorbing and instructive read. But the book also served another vital purpose when we were on holiday. I used it to squish the pesky mosquito that had been greedily gorging itself on my blood during the night, leaving me covered in nasty bites. Kind of a fitting use for a book oozing with the guts and gore of ancient battles.